SO WHAT MAKES THIS PRODUCT SO GOOD? Fire Knock Out is a revolutionary device and gives new means for fighting fires effectively. It is easy to use as well as being small and light weight. This product works extremely fast as soon as it comes in contact with flame. A fire can be tackled right from the time that it starts, limiting consequential damage. The contents of Fire Knock Out are not harmful to people, animals or the environment and can be applied both preventively and actively. 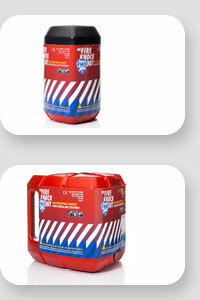 Fire Knock Out is a unique product due to the system that activates itself and is very suitable to immediately fight fire which may develop in unguarded rooms. Available in two sizes, 1.6 which caters for an area of 2 square meters and 5.6 which caters for an area of 5 square meters. With no maintenance required Fire Knock Out can offer you 'piece of mind' knowing that your property is safer from potential damage when it comes to fire. For more information click here to download our free brochure or click here for the International Fire Knockout Website.